If you want to give your best attention and care for your pet dogs, and you are on a lookout for a dog water dispenser, then this collection of best automatic dog waterer reviews can help you make a choice. An automatic dog waterer is a dog water bowl which provides your furry friend with an ongoing and regular supply of clean and fresh water to drink from at all times. It is particularly helpful for pet owners who don’t want to constantly worry about refilling their dog’s water bowls from time to time. Consider the following as your guide. All of them are based on extensive research and actual customer reviews and feedback. This way, you’ll get the best information to help you in decision making. With more than 4,300 customer reviews and a 4.3-star rating on Amazon, PetMate Replendish Gravity Waterer w/ Microban boasts one of its best features, which is its extra large capacity. It can hold up to 4 gallons of water. This type of water dispenser is available in several colors such as brushed nickel, pearl blue, pearl white and peacock blue. This water dispenser is made up of PET or polyethylene terephthalate plastic. This type of plastic is BPA-free and safe for canines and other pets alike. It also uses a water filtration system to reduce as well as remove all chorine and chemicals, which in turn helps keep water fresh. Its Microban Antimicrobial Protection prevents stain as well as odor-causing bacteria. The bottle design of this product has a wide mouth, making it easier to clean without spending too much effort. The only disadvantage for this product is that it can get quite slippery and heavy when refilling or moving around. So one must be careful when handling or refilling the water dispenser. For pet owners who want to store a large amount of water in their dispenser, this would be an ideal tool. Aside from that fact that there are a variety of colors to choose from, the bottle design is also very easy to clean. It can be perfect for pet owners who are always on the go and don’t have much time to clean their pet water dispenser from time to time. I give it a 4.5 star rating. PetSafe Drinkwell Original Pet Fountain is among those automatic dog waterers that encourage your furry friend to drink up and keep hydrated. It currently has more than 5,000 customer reviews on Amazon and has a 3.8-star rating, making it one of the most popular water dispensers available online. 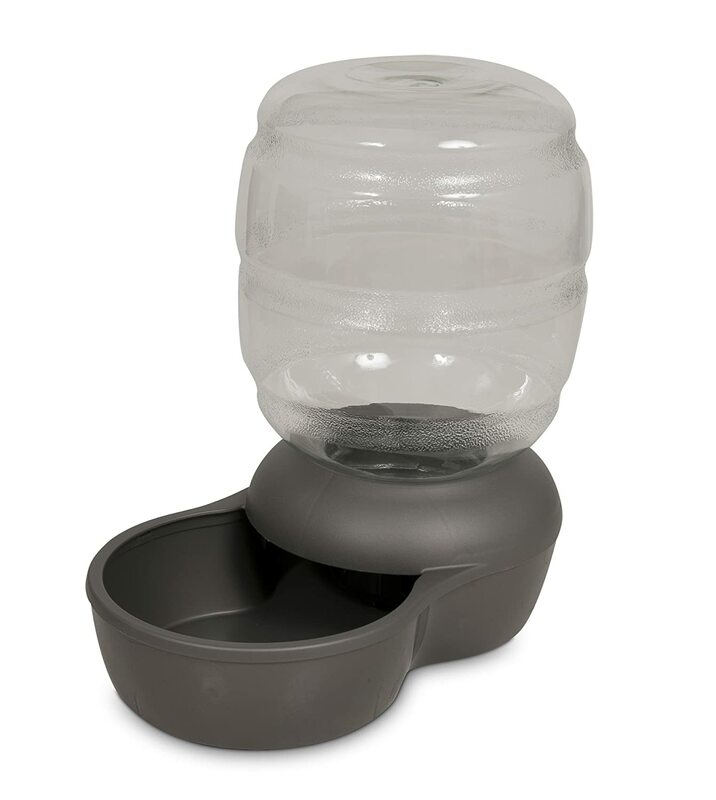 This type of water dispenser holds up to 50 ounce of water which is perfectly suitable for your little dogs. It encourages your dog to drink up with the use of free falling stream design. Aside from this, it also has a control knob which allows pet owners to adjust the flow of water depending on their preference. This type of water dispenser is also BPA free as well as it is safe to clean in the top shelf of your dishwasher. What most customers love about this water dispenser is the motor is silent and only maintains a low hum sound. There will be a minimal loudness but only when there isn’t enough water in the bowl. You might need to check this product on a regular basis. It's because dogs, as well as cat hairs, can clog the intake. That is why a thorough cleaning at least once a month is recommended. This product’s control knob adjusts the water flow is a key point of this product. This makes it one of the most highly recommended products when it comes to automatic dog water dispenser. I give it a 4.5 star rating. This product didn’t get a 3.8-star rating on Amazon just for nothing. Check out its best features below. The Easy Clean Auto Fill Water Bowl with 5 Ft Long Stainless Steel Hose has a compact, lightweight automatic filling water bowl which provides a whole year round of water supply for your dog. It works great not just for dogs but other livestock animals as well as horses. Its product package comes with a durable braided stainless steel with a five ft long flexible hose. It also comes with a brass faucet connector as well as a cleaning brush. Most customer complaints about this product are that it can get leaky if not properly maintained. Proper usage when handling or refilling this type of water dispenser is highly recommended. For pet owners who also happen to have livestock animals on their farm or yard, it would be an ideal water dispenser. However, pet owners should be extra careful in refilling or handling this product for leakage might cause damage if not properly used. I give it a 4.3 star rating. This product got its inspiration from a Mason jar, which can be a perfect addition to your home. It is also one of Amazon’s 4-star rating product. Check out its features below. 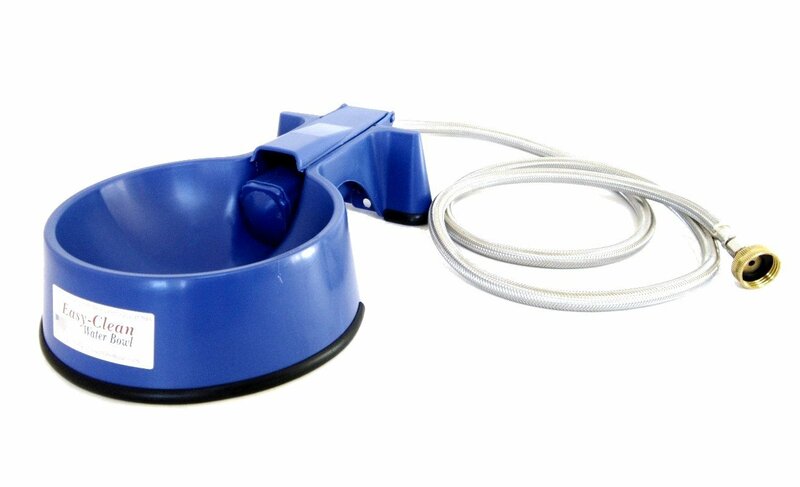 This type of automatic dog waterer has a large capacity gravity flow design, a steady source of fresh water. So your pet dog will never run short in the water supply. It is also BPA free which is good for the environment. This product also boasts of its self-replenishing plastic feature. It is made up of 96% pre-consumer recycled plastic for eco-friendly pet owners. Most Amazon customer negative reviews about this product is that it can also get leaky if not properly maintained. Also, other customers find this product a bit too expensive. 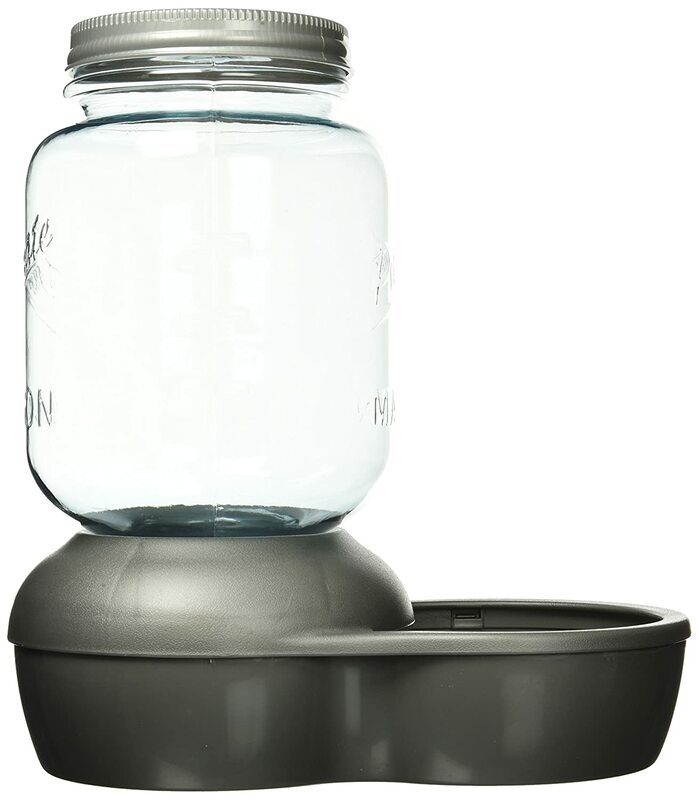 With this product, it's safe to say that pet owners don’t need to worry about running out of water supply because of its large capacity and unique gravity flow design. This product is perfect especially for those who are willing to spend money on keeping their dog water dispenser always in good condition. I give it a 4.5 star rating. All products mentioned above has its advantages and disadvantages. Most of these products boast not only of BPA free specifications but also easy-to-clean design features. Overall, they are reliable, and work great for your pet dog. However, the two that stand out among other products are PetMate Mason Replendish Waterer and Petmate Replendish Gravity Waterer w/ Microban. Both have lots of positive customer reviews. Both products also prove that their pets at home are carefully checked from time to time without the hassle of being “there” all the time. To those who are willing to spend a few extra bucks for their pet’s water dispenser, then Petmate Replendish Gravity Waterer w/ Microban might be a good one for you. We should all know that dogs need to get hydrated as much as possible. However, did you know that excess water intake may cause our dog to acquire a certain kind of disease? The condition is called Polydipsia, a rare case of disease acquired when the water intake goes beyond the normal. For more information about Polydipsia. In other cases, the pet’s body is not able to control water loss even at a normal temperature. There are also other cases which dogs tend to have the low water level in their body. It causes them to pant a lot and lose water through evaporation. In other words, you need to ensure that your dog is drinking enough amount of water from time to time. This is to avoid some possible dog diseases caused by poor water intake. Other types of diseases your dog may acquire due to poor quality water intake are kidney and acute renal failure. For a complete list on how these certain diseases affect your dog’s health. Materials – most pet waterers come either in porcelain ceramic, plastic or stainless steel. Ceramic and stainless steel are both high-end options. However, plastic is still a safe option. Just make sure that the plastic is BPA free. Filtration – To remove debris and keep the water cleaner for your pet dog, carbon filters are a must. Most products available today now have an additional foam filter to remove dirt further. Carefully read the instructions given on the product package when replacing or cleaning these filters. Water Flow – Some products help you adjust the speed of the dispenser’s water flow based on your dog’s preference. 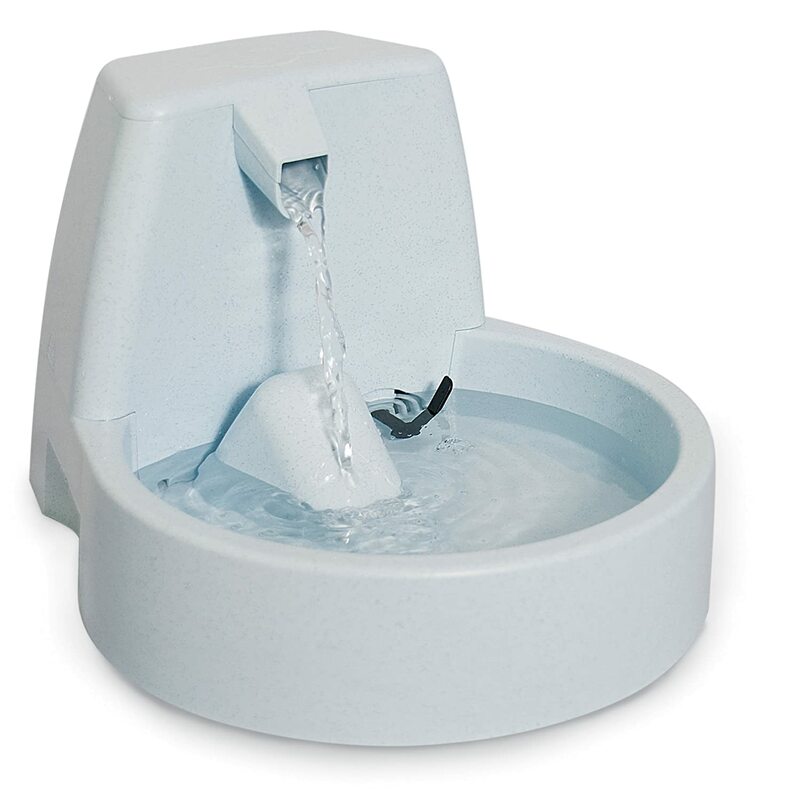 Several effects such as the full fountain, one spot or multiple water outlets are also available to choose from. Cleaning- We don’t want our dogs to drink filthy water, so you need to know how to clean the water dispenser. Ensure that the product you are going to buy can be easy to disassemble. This way, the cleaning process won’t be a difficult task for you. Most products available in the market comes with cleaning kits included in it. Size and Location – Always keep the water on a certain level with a pump. When the water gets too low, the tendency is that it will be unable to circulate. Most water dispensers have a line which allows you to identify where the level of the water needs to stay. It helps avoid any damage to the water pump. Automatic dog waterer is a great way to ensure your dog is drinking not only the cleanest but also the best tasting water. Keeping them healthy and happy is one of our top priorities as pet owners. Have you used an automatic dog waterer for your pet dog before? If so, how does your dog enjoy it? How does the water dispenser make your life easier? We would love to hear your thoughts. Write your comment below.